The Encyclopedia of Science Fiction mentions two caveats as to the usage of the term. First, while the setting may be in an alien world, its nature is of little relevance to the plot, as is the case of James Blish's A Case of Conscience. Second, hard science fiction tales are excluded from this category, where an alien planet, while being a critical component of the plot, is just a background for a primarily scientific endeavor, such as Hal Clement' s Mission of Gravity,  possibly with embellishments. A significant precursor of the genre is Edwin L. Arnold's Lieut. Gullivar Jones: His Vacation (1905). In Science Fiction: The 100 Best Novels (1985), editor and critic David Pringle named Marion Zimmer Bradley and Anne McCaffrey two "leading practitioners nowadays" for the planetary romance type of science fiction. There is a significant overlap of the genre with that of sword and planet. 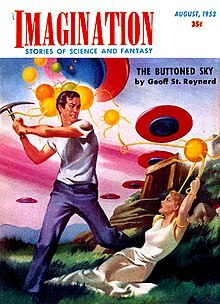 Much of the science fiction work of Jack Vance: the Big Planet duo, the Alastor trio, the Durdane tetralogy, the Cadwal Chronicles trilogy, the Tschai or Planet of Adventure tetralogy, most of the Magnus Ridolph stories, the Demon Princes pentalogy, and various stand-alone novels such as Maske: Thaery and short stories such as The Moon Moth. Forbidden Planet — an early film in the genre (1956), set entirely on the planet Altair IV. Thor: Ragnarok - A film based on Planet Hulk. ^ See Science Fiction Citations: Planetary Romance Archived 2008-01-08 at the Wayback Machine; and John Clute, "Planetary Romance", in Encyclopedia of Science Fiction, ed. John Clute and Peter Nicholls, 1995, ISBN 0-312-13486-X. ^ David Pringle, Science Fiction: The 100 Best Novels, An English-language selection, 1949–1984, London: Xanadu Publ, 1985. Page 17. Pringle does not include any Bradley or McCaffrey novels. Introducing his selections, he says, "I admit to blind spots—for example, I have little affection for the type of sf story which has been called 'planetary romance'". This page was last edited on 7 April 2019, at 00:52 (UTC).